While many film and theater posters entice viewers with direct eye contact and a strong emotional connection, others build tension by denying that basic human satisfaction. The giant brimmed hat featured in Waldemar Swierzy’s 1973 film poster for Midnight Cowboy hides the character’s eyes. The portrait focuses our attention on the man’s full, ripe lips while suppressing feelings of intimacy or understanding. Swierzy’s poster starkly translates the emotional conflict of this grim film about the life and death of a male prostitute. In a theater poster by Benker & Steiner (1996), a family is gathered around a dinner table. Flat dots of color block the faces of everyone except the beleaguered patriarch, who is leashed like a dog to a table leg. He looks at us, and we look at him. He gives the scene its point of view, its center of gravity, because he is the only one equipped to communicate—not with those around him, but with us. Poster, Zürcher Theater pektakel [Zürich Theater Festival], 1996. Benker & Steiner Werbeagentur AG (Switzerland) for Zürcher Theater Spektakel. Offset lithograph. 128 × 90.5 cm (50 3/8 × 35 5/8 in.). Gift of Sara and Marc Benda, 2010-21-91. 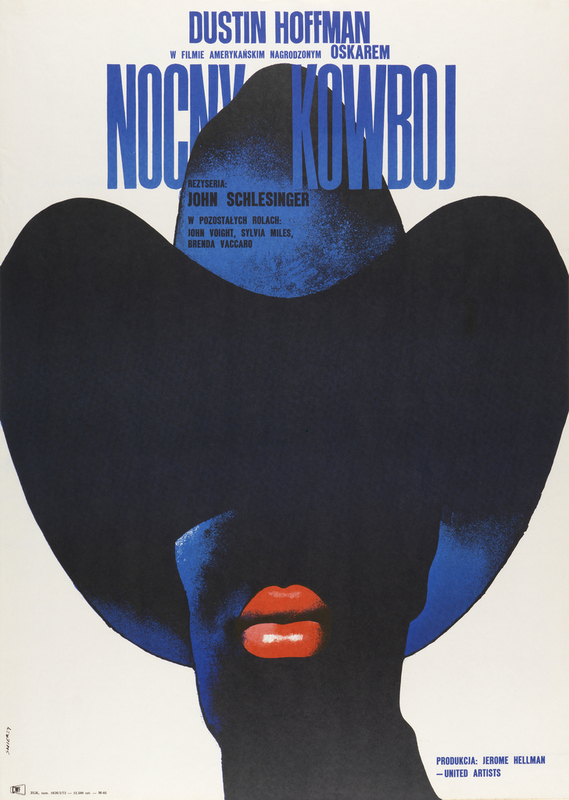 Poster, Nocny Kowboj [Midnight Cowboy]; 1973; Waldemar Swierzy (Polish, 1931 - 2013); Offset lithograph on wove paper; Gift of Sara and Marc Benda, 2010-21-103.